I haven't played Louisville in almost a year, and I had two gig offers for tomorrow night. Two! I'm kind of thankful that I accepted the first one before I knew about the second. Otherwise it would have been a super-duper-hard choice to make. Let's focus on the one I AM playing. One of my favorite NPR shows, The Moth, is coming to Louisville tomorrow to record the finalists from the previous local Moths. My job? Well, it's definitely not my usual BK show, but I will be there on the accordion all night long, gently (or as gently as you can on the accordion) letting the people know their time is up. You know, like when the orchestra at the Oscars cuts off the acceptances speeches when people start thanking the Best Boy Grip. Anyway, I've listened to The Moth Podcast for years. It's gotten me through many a long walk and even longer drives. Believe it or not, musicians in bands can't always agree on what kind of music to listen to while on tour. But a story? Most people love a good story. I always keep the podcast on my phone in case of emergency. Meal planning, freezer fills, and suggestions. I don't have the world's best kitchen. Actually, the kitchen we had in our one-bedroom flat in Edinburgh was bigger and better-designed than ours. Ours, however, is significantly better-furnished. I know all you really need is a wooden spoon, but I kind of adore cooking gadgets. Thankfully, the thief was obviously not much of a chef because he didn't take any of our kitchen stuff. It's already personal, but if that KitchenAid Stand Mixer had disappeared, he would have needed to flee the country, not just the state. Anyway, I'm way excited that the wee boy is big enough to sit in a high chair, giving me a bit of freedom to cook. Colleen, a mum-of-two who works full-time and still manages to keep a Martha Stewart home and a Food Network-worthy menu plan, stocked up our freezer last week with delicious vegan meals ranging from homemade hummus to chili. (I'm vegan these days because the wee boy pukes excessively and cries a lot when I eat dairy.) We are almost out of the ready-to-eat freezer meals, and I'm feeling the need to stock up on my own. Somehow menu planning is still baffling to me. I found this website, which is a genius idea and does all the planning work for you, but 1) I don't have the money to sign up and 2) there isn't a vegan menu option anyway. Help? Send me to your vegan Pinterest page maybe? Or any of your favorite one-pot meals? I think one-pot is all I can handle right now. It's been a while, folks. I need to get back to food pictures and posts. These baby pix are getting old, right? Things I don't miss about Scotland. While once I thought white pepper was a glorious discovery that would allow me to pepper my alfredo sauce without the black spots, I now think it smells like dirty socks. In most place in the UK, you'll find white pepper in a pepper shaker. Ewwwww. Seriously, with a guy as hip as Richard Branson in charge of your company, you'd think you'd get some decent customer service. These people make US mobile phone companies look like Mormons. (Sorry if that is offensive, but I found most Mormons to be the kindest people I've ever met. Creepily so, but kind, nonetheless.) Anyhoo, we've canceled our mobile phones at least four times now, and we're still being automatically charged every month. Happy Burns Night! Toast a haggis for me. Deep thoughts on human nature and stuff. Living in Scotland was idyllic. Cobblestone streets, castles, doctors who make house calls, and complete strangers who open their homes to touring musicians. Ask someone for directions, and they'll likely walk you to your destination. Arrive in a new country with no place to stay, and acquaintances will take you in for a week -- making lifelong friends. I've always been of the school of thought that people are, by nature, good. Rousseau was my favorite -- well, a tie with David Hume -- philosopher, and nothing could convince me otherwise. Then we landed in America. Within a week, my purse was stolen, we learned our storage unit had been ravaged, and I started to re-think Hobbesian theory. It's been a rough several weeks re-adjusting to life over here. Thankfully, our friends have come out of the woodwork to prove that there are incredibly good people everywhere. Second, we've got a room full of baby hand-me-downs that friends, acquaintances, and even complete strangers have generously donated. I'm eating my words about babies not needing "stuff." We've discovered that unless you want to hold your baby 24-hours-a-day (I'm all for babywearing, but my back is killing me), some of that "stuff" is actually kind of important. The wee boy now has a Bumbo, a swing, and a high chair, not to mention bags of little toys to shake and rattle. He's spoiled already! And he loves it. Third, we had been living off of noodles and frozen edamame, as we hadn't had the time to get to the store, much less to cook. Our refrigerator looked like a bachelor pad -- pizza boxes and ketchup. What happens? A most wonderful friend shows up with bags and bags of vegan meals for the freezer. I thought we'd missed out on that whole casseroles-to-the-new-parents or apple-pies-to-the-new-neighbors routine. Anyway, I just thought I'd share my philosophical discovery: It turns out people are good. But really, how could you look at that face and think otherwise? P.S. Totally forgot to mention the amazing friend who hired a housecleaner to clean out the nastiness that our renters left behind!! Order on the horizon. And Pinterest. We are back in our house, and I am starting to feel an inkling of normalcy. After a year and a half of living out of a suitcase, I see order on the horizon. Unfortunately, instinct tells me I'll likely be living out of boxes for the next few months. We seem to have given away or sold our tables, bookshelves, and other furniture-that-contains-things. Meals are eaten either standing or off of stolen-from-my-parents-but-they-didn't-notice-until-they-read-this-blog TV trays. Also, I'm afraid to put things into drawers without first deeply consulting Pinterest (www.pinterest.com/brigidkaelin if you like vegetarian food and castles). Surely I've been organizing incorrectly for years, and there are probably some very obvious storage suggestions I have been blind to all this time. Not to mention that the renters here (one of whom I absolutely adore and would rent to again in a second, provided she didn't have any roommates) seem to have left their mark in every. single. room. I think we've been to the hardware store more times in the past month than I have in my life. Anyway .. chaos! But also, some music news to announce soon. Finally!! How do Stand-up Comedians do it? Major artist dilemma here. I've become increasingly concerned about what people think about me. You see, I've unintentionally hurt people's feelings here and there by things I say or joke about on my blog. The last time it happened, I just clammed up and stopped writing all together. It's no one's fault, but it really got to me. I know I shouldn't care what other people think, but I do -- especially friends and family members, whom I love dearly and who I know (well, now I know) read my blog. This morning, I decided to stop caring and just write what's on my mind. We'll see how long that lasts. But seriously ... how do people like stand-up comedians do it? They've been making jokes about their mothers and co-workers since "Take my mother/wife/sister, please," and probably before then. Are they all single and creepy (I'm picturing Frank on 30 Rock here)? Are their parents dead? How can they make those in-law jokes if they are single? Do their relatives and friends not pay any attention to their career? Do they just not care? Seriously, I'm curious. How does that work? I mean, I have all kinds of funny stories rolling around in here. Somehow I never had this problem with songwriting. Once you put a melody to it, either everyone assumes it's about them or NO ONE assumes it's about them. That makes it a lot easier. Prose is a lot more personal. Goodness, when I blog on no sleep, I write like a first grader. Rule one of blogging and middle-school journaling: never re-read or you feel like a moron. Must. Follow. Rule. Or maybe I should follow a more professional rule: never publish blogs you haven't edited when you're living on fragmented sleep. So, yeah, sleep! Every time this wee boy gets into a great little sleep routine, we up and move time zones or houses. Then it's back to square one. The poor guy has stayed in six places in 15 weeks, and we are just ready to move back into our old house in the Highlands -- that's the Highlands of Louisville, regretfully not the Highlands of Scotland. It's funny. They say babies need and love a routine. I'm pretty sure that he's a go-with-the-flow kind of boy, however, and that, in reality, it's me who needs a routine. I like to know just how much sleep I'm going to get in a night. If I know I'll only be getting four hours all night, that's fine. I can Margaret Thatcher that all day long. But if I get six hours in a row two nights in a row, and the third night I'm back to four ... well, then, I'm a grumpapotamous. I do have lots to say, though. I want to finish my series of posts on Having a Baby Abroad and share my birth experience (in words, not video, do not fear!) with you. I've got a few other parenthood insights I'm desperate to share. 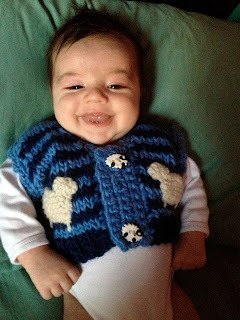 I've also got some completely unrelated-to-baby posts in me. And someday soon, I hope to post something music-related. 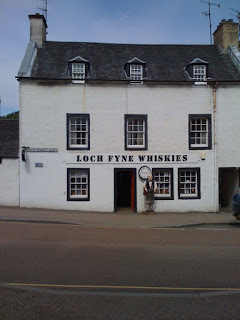 Downton Abbey, Inveraray, and Thieves. I'm rarely ahead of the curve when it comes to television shows, but let me boast here: I have seen all of Downton Abbey Season Three! It's due to geography rather than subterfuge ... I lived in Scotland while season three aired on ITV over yonder. The last episode of the season (don't worry, this is not a spoiler) takes place in Scotland and was filmed at one of my favorite castles. In fact, I've been to Inveraray Castle three times and have played the town twice. It's a beautiful coastal village with the best whisky store I've ever been to, Loch Fyne Whiskies. Here are some pix of Inveraray, Scotland, that I just felt like sharing. I'm hoarding all kinds of travel photos, and it's high time I started posting them. Ther's a video lurking around somewhere ... when I find it, I'll be sharing. Anyway, I'm glad I've already seen DA3 because David and I no longer own a television, thanks to an kind subletter/thief who decided to liberate our storage room and relieve us of pretty much every electronic we owned, along with David's shoes and various other sundries. Welcome back to America, right? Hello, 2013! Last year on New Year's Eve, I was high atop Calton Hill watching fireworks over Edinburgh Castle. This year I was asleep by 8:30. We had a rough night on December 30, having spent the day on two airplanes and in three time zones. The wee boy's a good traveler, but he doesn't care for a change in bedtime routine. Anyway, it's January 1, and we are finally back in Louisville for what I hope is an extended length of time. I'm tired of living out of a suitcase, and I can't wait to book a few gigs. In the mean time, I'm singing a song at ye old Townes Van Zandt Tribute tonight. I'm stoked to have nothing to do with the planning this year, and all I have to do is show up and sing a song. Do you know how much work it was to wrangle 30+ artists and put a show like this together? 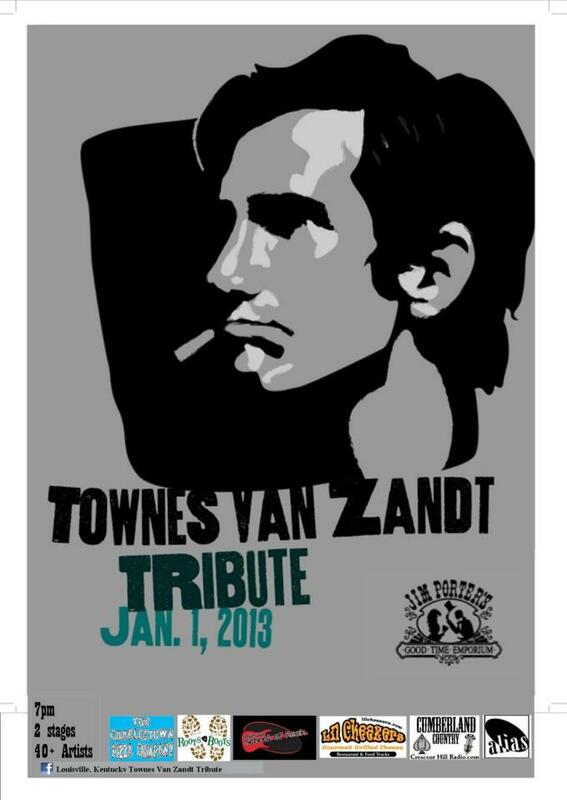 I love Townes, but I'm so glad someone else has taken over coordinating it. Anyway, I'm on the Ballroom stage at 8:12 pm. Finished by 8:15pm. Maybe I'll be asleep by 8:30 again!